It’s been almost 15 years since Skype launched and soon you’ll be able record calls on the app. What a time to be alive. Skype used to be the monarch of video calls, but it has fallen behind its competitors in recent years. One reason for this is the shoddy updates and lack of features we now take for granted. Microsoft has announced some major feature updates for the app that will be rolled out over the coming months. And, in all honesty, these should’ve been available for some time. Examples? Read receipts (what? ), private conversations (come on), profile invites (sorry? ), and, of course, call recording. Bad news for these companies. The call recording feature will be completely cloud-based, which is useful for people working across different devices, as they’ll be able to access their conversations from anywhere. And, when you start recording, everyone on the call will be notified, so there’ll be no nasty surprises. The above features aren’t available yet, but will be released as an update to version 8.0 of Skype, which is available now. An example in point: you can now “@” users and there’s a chat media gallery, so you can look at stuff you’ve shared. Features that have existed on iMessage, WhatsApp, and others for years. 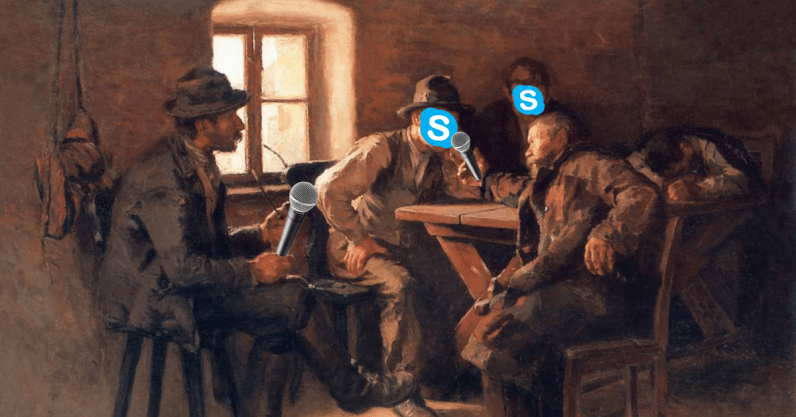 Skype has in the region of 300 million monthly users, but growth is static. Whether or not these updates will increase that number remains to be seen. At the least, these new features should stop many more people leaving the platform entirely.